The FIA Foundation for the Automobile and Society is an independent UK registered charity, founded in 2001. 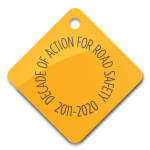 Dedicated to innovative global road safety philanthropy and high impact strategic advocacy in the areas of road traffic injury prevention and motor vehicle fuel efficiency, the Foundation supports an international programme of initiatives to reduce road injury and fatality. In partnership with other leading road safety champions, the Foundation supports programmes, pilot initiatives and campaigns in more than 80 countries around the world, and was instrumental in the enactment of the UN Decade of Action for Road Safety 2011-2020, and actively campaigned for the inclusion of road safety objectives in the UN’s 2030 Sustainable Development Goals agenda. The Foundation implements a number of road safety projects around the world together with public authorities—enforcement agencies, educators and public health leaders—to influence laws, raise awareness, provides education and safety aids to ensure sustained and lasting behaviour changes. At the heart of the FIA Foundation’s approach is our support for road safety programmes, projects, and initiatives designed for impact. We believe in activist philanthropy, working closely with partners to build programmes. As a donor to the World Bank’s Global Road Safety Facility, our funding has enabled national capacity building efforts and helped to unlock hundreds of millions of dollars in new financing for road safety. And, through our Road Safety Fund, managed in partnership with the World Health Organization, we are facilitating private sector/NGO alliances to support the implementation of the Decade of Action on highways and streets around the world.